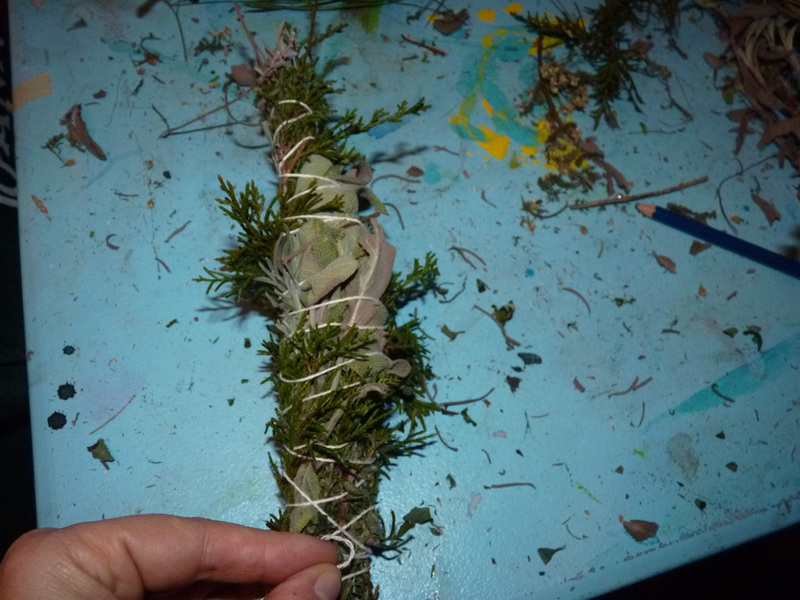 As a druid, someone who connects to the local landscape spiritually, I’ve gotten my fair share questions about cultural appropriation and druidry’s relationship to indigenous practices, particularly traditions indigenous to the USA. The conversation may go something like this, “So druidry, is that like Native American?” My response is, “Druids and Native Americans both honor and respect the land, and see spiritual significance in nature. However, Druidry comes from a different cultural tradition (the British Isles, particularly Wales) and our relationship with the land, spiritual practices, and celebrations are completely different than indigenous peoples in North America” Another thing that happens with some frequency is that I describe something on this blog, like land healing, building sacred spaces, or other such spiritual work. And someone who has never commented before leaves a comment that says something like “You don’t have a right to do that, this land belongs to Native Americans” or “You need to ask permission from those who used to live here to work spiritually with the land.” I usually delete these comments because they seem more concerned with virtue signaling than about honoring and healing the land and building bridges or building understanding. But in my time in druid leadership in various places, I see a lot of white druids seriously grappling with these same kinds of questions and issues–and so I want to share my thoughts. Another observation: here in the US, white people who are trying to reconnect to their land spiritually carry around a lot of baggage. Guilt about the atrocities that were committed so that we could live on this land, guilt about what was done before we were born, guilt about always being an “imposter” here on the land, guilt about living here now. Even if you don’t know your family history, if you are white, the cultural history and legacy of the broader US are more than sufficient. There’s also a lot of fear–fear of connecting deeply with nature, fear of appropriation (even inadvertent appropriation), fear of doing something wrong, of somehow doing more damage than has been already done. I never realized the extent of this fear and guilt–even within me–till I met druid who had recently came from Europe and moved to the US. I connected with her at a druid event where I was leading a workshop and ritual. After the workshop, she said to me that she felt that Americans were so afraid of their land. After her comment, we had more discussions and I started to pay attention, and I realized how acute her observation was. Culturally, there’s also this idea that if you are a white person, you really don’t have the right or privilege to connect with the land here. So the guilt sets in, the fear sets in, and people do nothing. How, then, can white American druids build a relationship with nature, given these cultural complexities? How can we build a relationship rooted in honoring the ancestors of the land and recognizing culturally, what work we have to do? And, do we have a right to do so? And why should we? Those questions are the subject of today’s blog post. 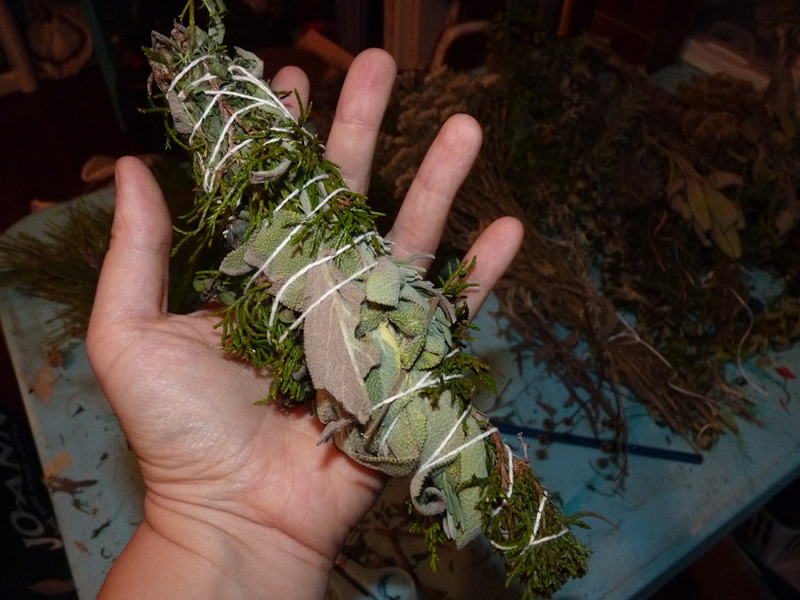 As I’ve discussed before on this blog, druidry as a spiritual path is ultimately about connection and relationship building. People who find druidry and take up the druid path are concerned with building deeper connections to nature, physically and in spirit, and in living a life that is nurturing of the earth rather than destructive of her. People from all walks of life, ethnicities, religious backgrounds, etc, can join the druid tradition; it is open to anyone who seeks this path. I want to frame this entire discussion about cultural appropriation in terms of relationship, as I think it is a useful and productive lens. So let’s start by thinking about the definition of relationship. Here are a few dictionary definitions, useful to get us started. Definition A: “the way in which two or more concepts, objects, or people are connected, or the state of being connected” and B: “the way in which two or more people or groups regard and behave toward each other.” In the case of druid practice, we are exploring ways that we, as 21st century human beings living in specific ecosystems, and coming out of specific cultural and historical traditions, connect spiritually with our living ecosystems around us. My definition here, then, accounts not only for a specific person, but that person living in a specific context, and bringing specific history with them. And it is this “cultural and historical context” that has everything to do with appropriation–but also, nature relationship. Here in Pennsylvania, prior to white colonization, old growth forests covered the land, producing massive amounts of mast crops (acorns and chestnuts) with about 1/3 of the total forest cover in hardwood nut trees; streams were clear and full of fish; animals and hunting lands were abundant. Native Americans, as M. Kat Anderson describes in Tending the Wilds, tended these lands and had them in a very healthy state of abundance. As non-industrial societies, they depended on the land, build spiritual practices surrounding their relationship to the land, and many tribes had rich animistic traditions surrounding the land and her spirits. Traditions that, in some cases, spanned hundreds or thousands of years. Framing this in terms of relationship–generations upon generations of Native Americans were tending the wilds and cultivating a sacred relationship with their landscape. Every person in that tribe gained strength from those ancestral connections to land, established over generations upon generations. Even for a native person today, those connections are still present, and I think they are beautifully described in the works of Robin Wall Kimmerer, among other native authors. The relationship metaphor is a really useful one here for breaking down why cultural appropriation is so problematic and why cultural appropriation should have no place in the druidry–or any nature-based spiritual practice–of white people. You might think about your current relationships you have with other people: each one is unique, each one is different. Your immediate and extended family and friend network are all relationships cultivated over a long period of time. Each person in you know has a different relationship with you than any other person. Maybe one friend is fun to hang out with and chill out, but another one is a good travel partner, and still another you can share your deepest secrets with. If you have a partner or spouse, certainly, that relationship is very sacred and very unique. You wouldn’t want another person to try to barge in and claim your spouse as their own–you would rightfully be defensive, angry, and demand that person stop. That’s essentially what I think appropriation is–taking someone else’s relationship with the land and claiming it as yours. It is no wonder that people whose traditions are subject to such appropriation are rightfully upset about it. Further, relationships are complex and nested. I’m individual, yes, with my own ethics, spiritual path, and decisions to make. I’ve worked hard to build my relationship with my local land over time. But I bring with me–in the very blood that flows through me–the DNA of my ancestors. I bring with me, for good or for ill, that cultural legacy and that history, the choices that they made, and I am living the benefits and consequences of those choices. As a white person, I simply cannot hope to have the same kind of relationship that a Native person has on this land today–because relationships aren’t just about individuals, they are about cultures and generations of people. Under no circumstances could I *ever* replicate someone else’s cultural relationship to the land, even if I tried. Not only is trying to do so problematic from a cultural, ethical, and historical standpoint, it is deeply problematic from a spiritual one (and I don’t think the land spirits are having any of it). My druid’s garden full of sacred plants! 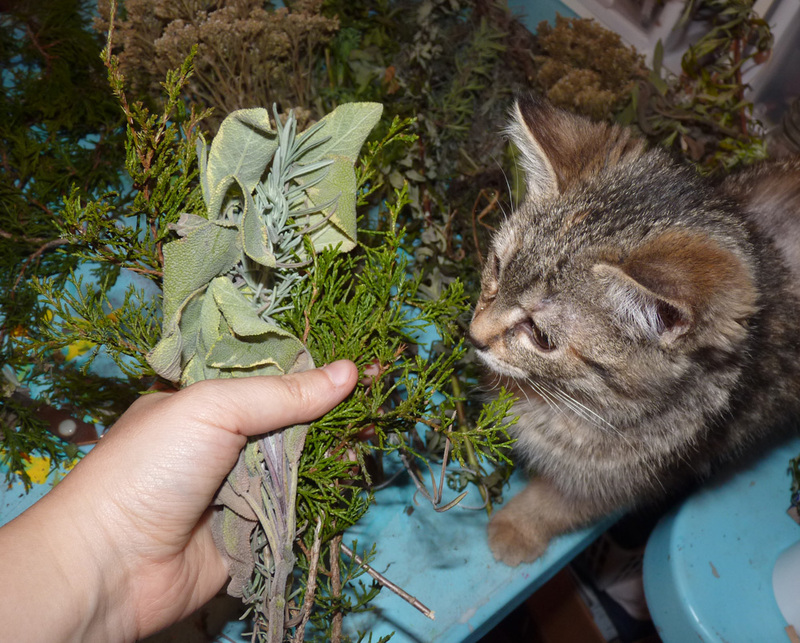 Now, let’s take a look at a very specific plant example here, to further illustrate my point. 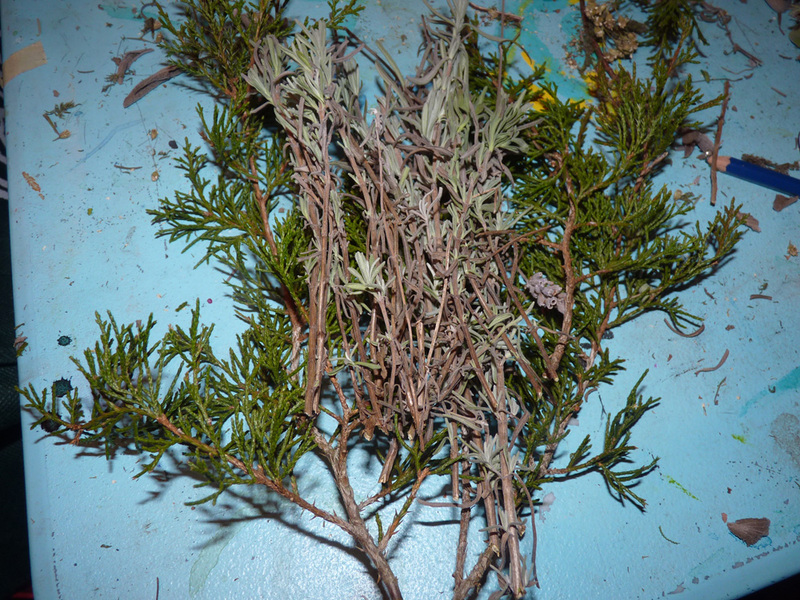 A few posts ago I wrote about the issues surrounding white sage and other at-risk plants. 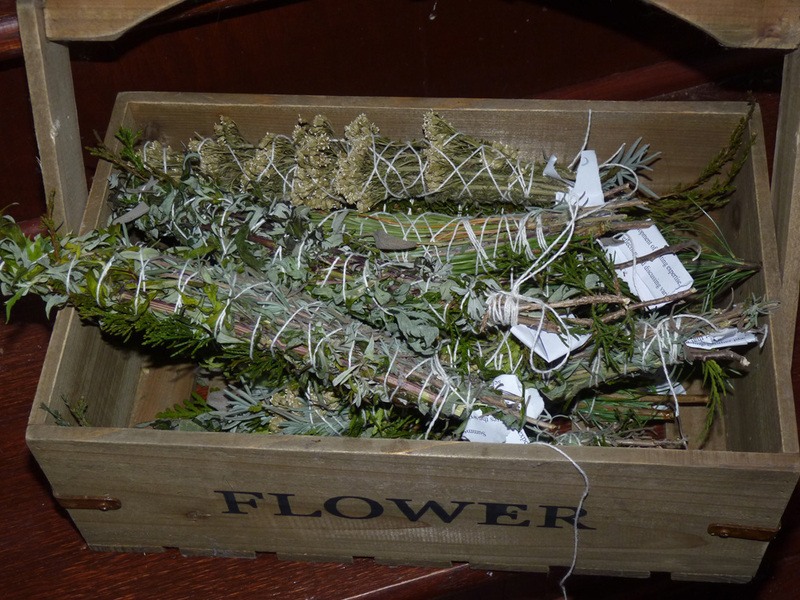 Let’s dig into white sage specifically, as it is an American plant used by a number of native traditions. 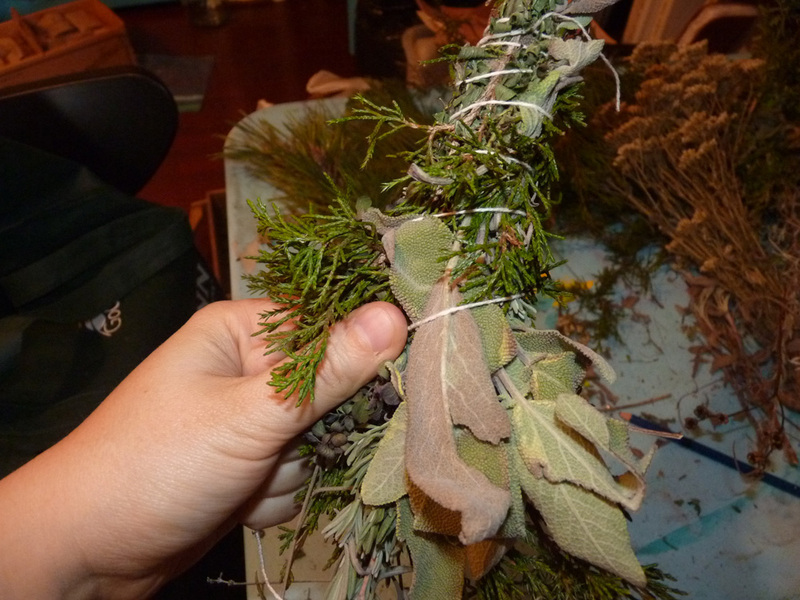 There are a lot of different perspectives surrounding white sage and whether or not white people should use it. 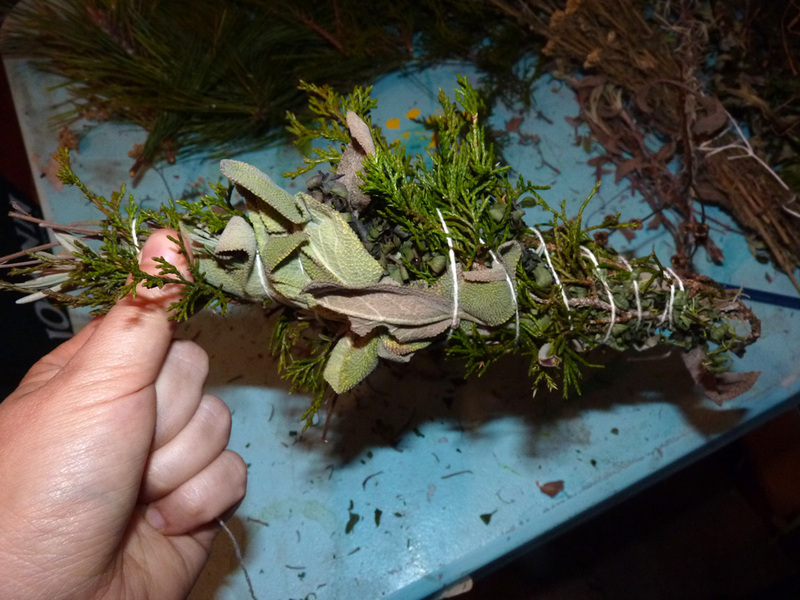 These perspectives range from “don’t even look at this plant if you aren’t native” to “buy white sage from natives and support them” to “anyone can use this plant for any purpose.” I think the first line of reasoning suggests that only one culture can have a relationship with a plant that grows broadly, thus, cutting off that plant medicine and spirit to anyone else. As a druid, I see all of nature as sacred, particularly, the nature growing in my own ecosystem, and I think each person and culture can build new relationships with plants. At the same time, I also think the last perspective is problematic, as that is the source of white privilege and cultural appropriation. What I see as the thing here is acknowledging that other cultures and people may have a specific relationship with a plant, and it is not ok to try to mimic that relationship with a plant. Instead, druids and others can build their own relationships with plants–relationships that are their own. 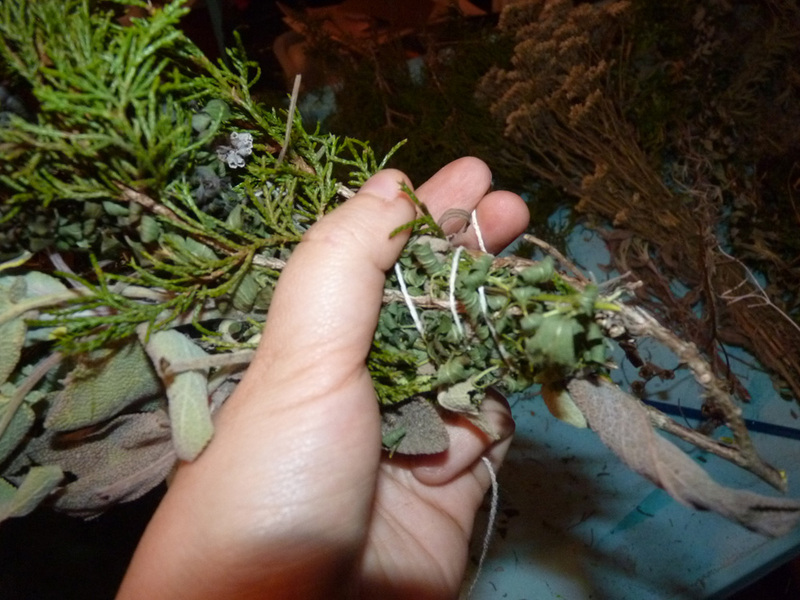 White sage certainly has chemical properties that may help clear and heal. 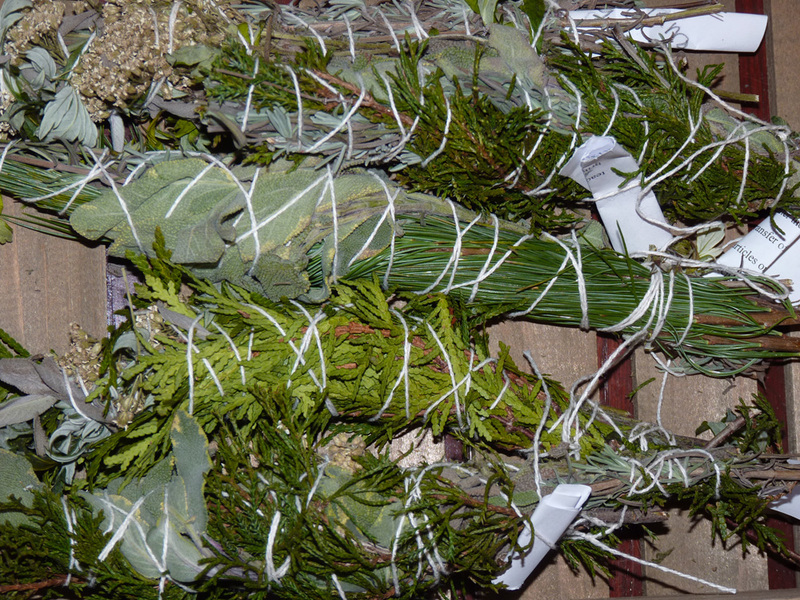 However, native tribes, such as the Luiseno and Cahuilla people in California, built up a very sacred relationship with white sage over millenia. 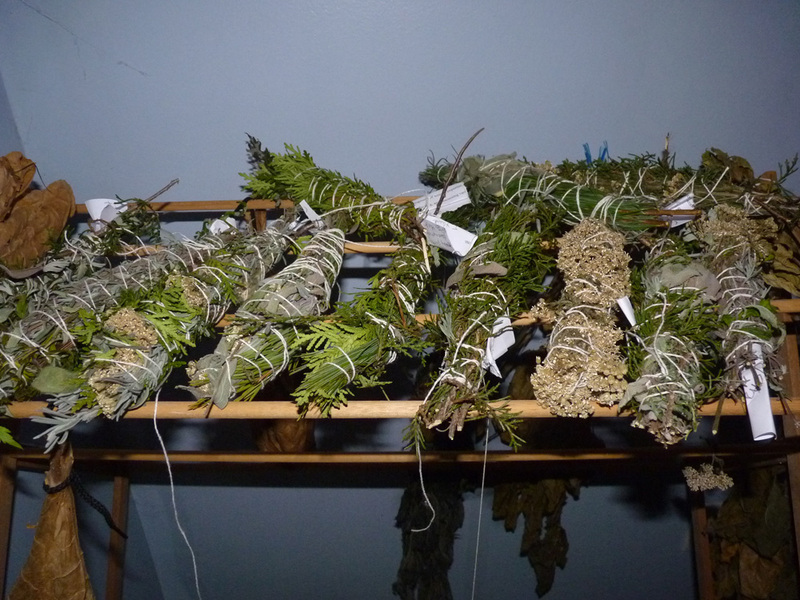 Someone who is not part of that cultural legacy has no right to try to claim that specific relationship with white sage. 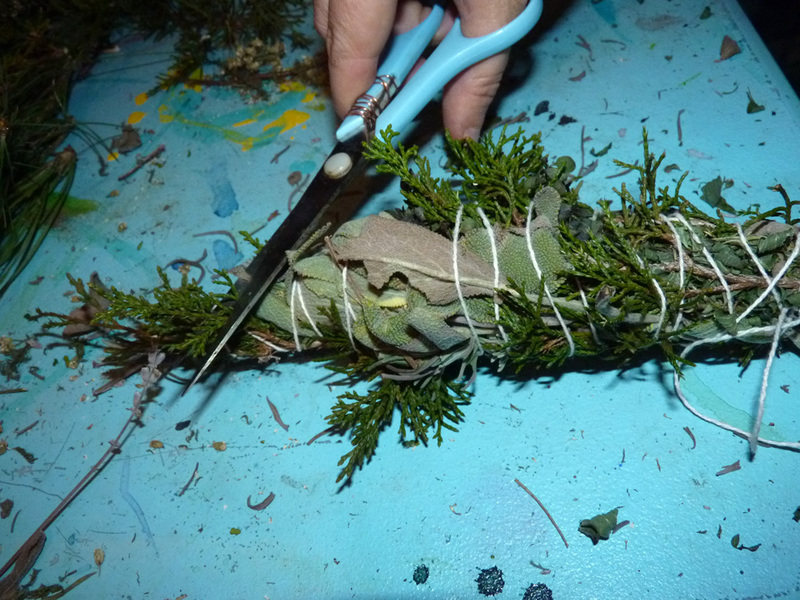 This goes back to why indigenous peoples get upset when white people try to appropriate their plants and ceremonies–its trying to lay claim to a spiritual relationship that belongs to a culture. If the plant’s use comes from a cultural tradition that you can rightfully access, then great, access it. But if it doesn’t, those doors are closed to you, and you will never have a key. But it will be yours. But what you DO have the ability to do is to create your own relationship. It will be a different door. It will be a different relationship. It will be a different key. The land, her spirits, here in the US, even after all that is happened culturally, welcome relationships with white people. But for white people living here, these must be *new relationships* and they need to be built upon acknowledging and honoring the past, building trust, and about repairations, accountability, and building trust. It is up to each of us to forge those connections, and for larger druid groups to start to do that on a broader, generational level. In other words, white people have build those relationships ourselves, and they are going to be inherently different looking because of our own identities, cultures, and histories. This is why talking about cultural appropriation matters–because we have our work cut out for us, and there are no easy short cuts. If we want to build deep, meaningful, and lasting relationships with the land here, we’ve got to do the work from the ground up. If we are appropriating someone else’s culture and spiritual practice, we aren’t doing the hard and necessary work of relationship building for our own tradition–hence, we are perpetuating more colonizing behavior. So, as white druids living in 21st century American soil, we have a lot of work ahead of us. I see at a number of things that we can do to build our own traditions and relationships with this land, and offer this list as a starting point. Become a nurturer and healer of the land. Reject the cultural values of exploitation and colonization that have shaped white people’s legacy here on American soil. Instead, work to reduce your own ecological footprint, learn to heal the land (through permaculture, sustainable living, conservation, other means), and develop a very different relationship with the physical landscape than other white people, past or present. Relationships with spirits are mirrored on the physical world. To get the land and spirits to trust you, to recognize you are different than other white faces that have come before, you have to behave differently–outside of the typical behaviors of exploitation. This is part of breaking down the past cultural legacy and establishing new patterns. Honor the ancestors of the land and recognize those who came before you on this soil. I think there are lots of ways to honor the ancestors of the land, and here are a few of those that I use. First, learn about who the ancestors of the land where you live. Learn about who they were, what they did, how they lived, their stories, and what happened to them. For example, the peoples who lived where my home is located now were Osage, Shawnee, and Susquehannock. Today, the Osage and Shawnee are in Oklahoma, which is where they were forcefully moved by the US government. The Susquehannok are said to be extinct. (To find out who used to live in your region, you might start with this site.) Once you know about them, find some way of honoring them regularly: perhaps say their names at the start of your rituals, create a shrine, or do an honoring ceremony as part of your practice. Support and recognize the rights of indigenous peoples today. If there are still native peoples in your area or region, find ways of supporting them–if they need someone to come to a fight or take a stand, be that ally. If there are not native tribes in your area, consider finding a cause that you can assist in that supports the rights of indigenous people regionally or globally. For example, I donate regularly to an organization called Cultural Survival, which fights globally for indigenous peoples’ rights. I also subscribe to their mailing list, which often has items you can take action on and keep you informed about global developments. I also think, as a white person, it is really important to do the “ground work” to speak up for indigenous rights. Have compassionate conversations with other people about cultural appropriation, indigenous rights, and history. Talk about these issues. Recognize your own flaws and misjudgments. Apologize. Learn and grow. Recognize that we are building relationships, over time, in a new way. Because we are white people on US soil, we have very little to build upon. We are here, inventing and growing this tradition organically, a tradition imported from white ancestors, yes, but from a far off place. While this is a major challenge before us, it is also a really exciting opportunity. In permaculture terms, we talk about the problem being the solution–in this case, our problem allows us to build something anew. Something that responds to this time, this place, and honors our own path as white druids in the 21st century while not dishonoring those who were here before us. This requires us to deeply invest our time in learning about the land through building nature wisdom, nature connection, and our own rituals. I hope this piece is helpful for those white druids who are struggling with these issues. For this post, I am indebted to members of Sun Spiral grove, who spoke with me at multiple settings about these issues, and including members of the grove who read and offered me feedback on this post. I also realize and recognzie that there may be things I haven’t thought about. This is a tough topic, and I appriciate your respectful feedback. Blessings! 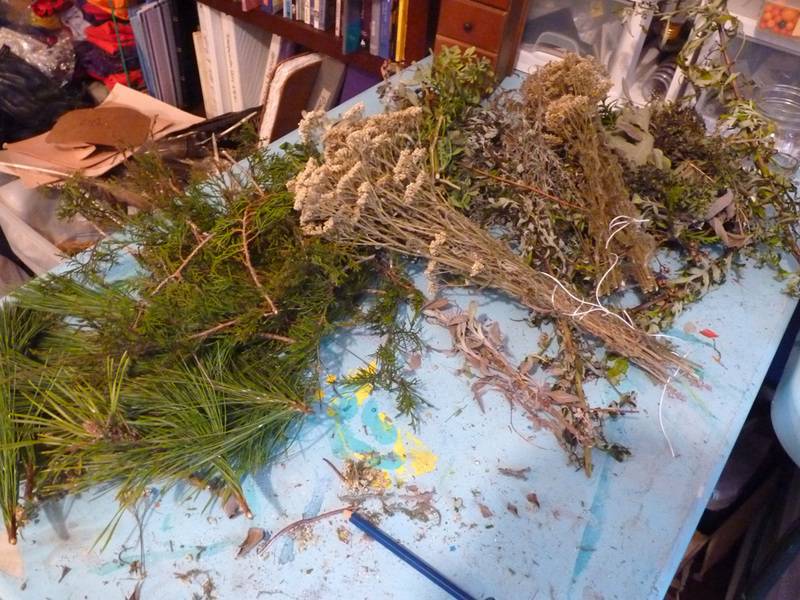 I just finished up my first weekend of Jim McDonald’s fabulous Four Season Herbal Intensive. We learned about the foundations of western herbalism and energetics (for a good introduction to this, Matthew Wood’s The Practice of Western Herbalism: Basic Doctrine, Energetics, and Classification). I have much learning to do in this area–I’m overwhelmed with how much I still don’t know! During the weekend of the class, I came down with some kind of nasal bug; it was exasperated by the presence of a dog which I turned out to have a pretty bad allergic reaction to. 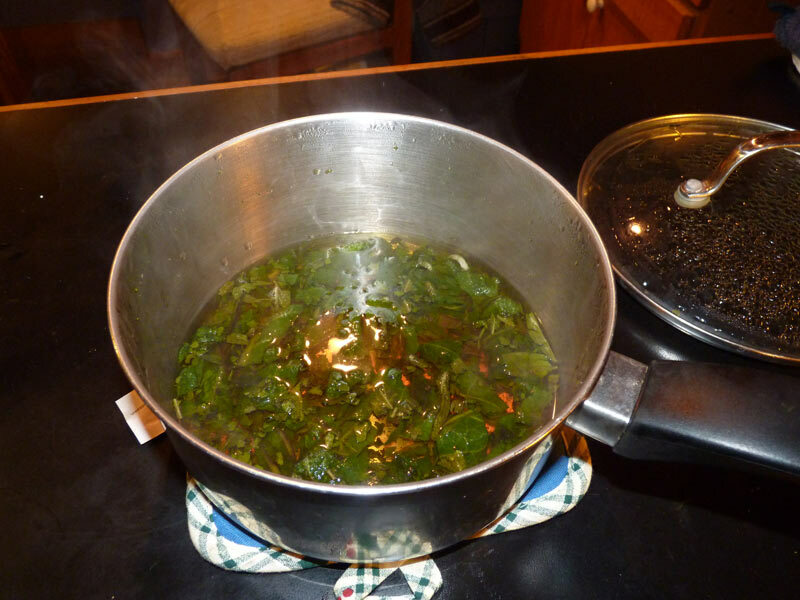 One of the things that Jim mentioned in the course for a good home remedy for lung and nasal congestion was doing a simple herbal steam inhalation. 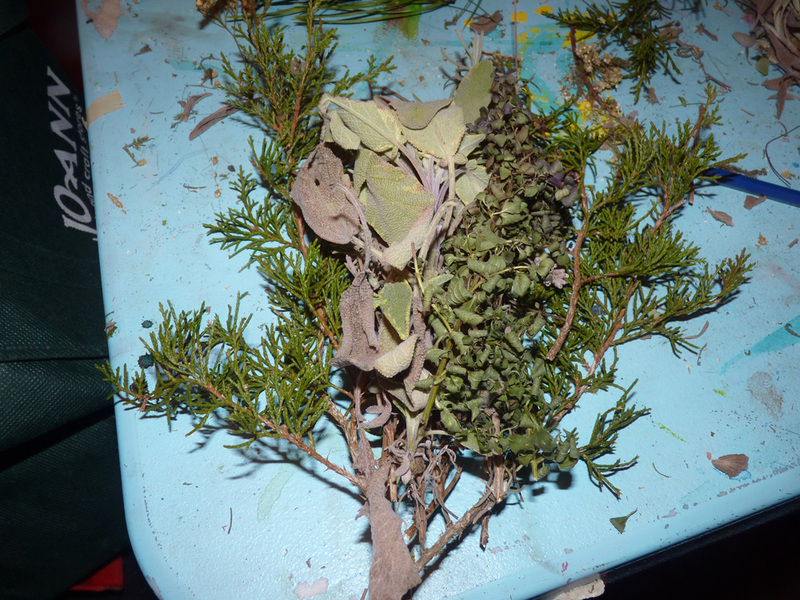 He said that most aromatic herbs will work well for this, and cited his favorites as thyme and sage. I decided to try out the steam inhalation this week to help get some of the crud out of the lungs and clear up the sinuses. I can’t believe how effective it was. 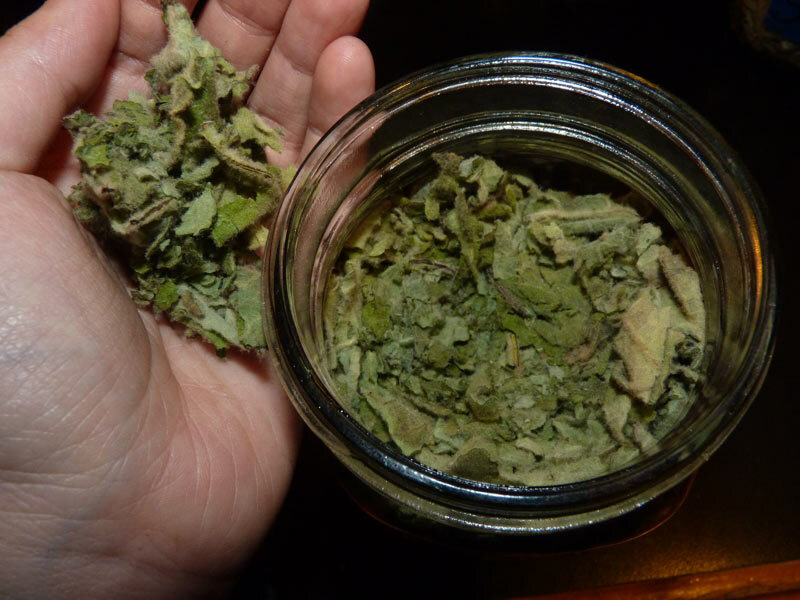 I chose two herbs–garden sage (Salvia officinalis), as Jim recommended, dried and saved from my garden and mullein (also known as lamb’s ear, Verbascum thapsus) which is a herb that I use a lot for healing of the lungs. Mullen grows wild in many places–I’ll do a post devoted to it later in the year when I can take some good photos. 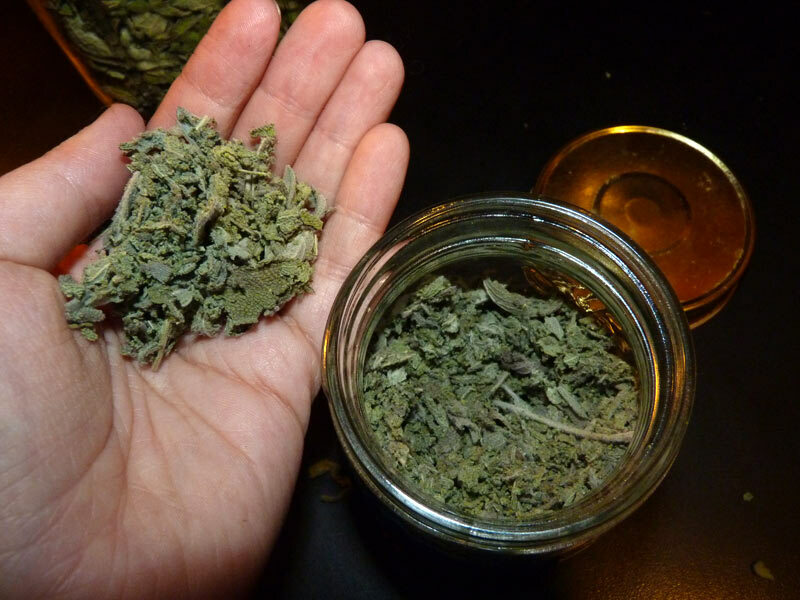 You want to make sure that these are herbs you have used before and that you know well. Mullein dried from last year! I’ve already gone through a jar of this just this past winter. The steam inhalation is very simple. You get a pot and put some water onto boil. I use my filtered well water….if I had city water with chlorine, I’d probably buy distilled instead, because there is no way I want that in my lungs. Get a lid for your pot, and bring your herbs and water to a boil. 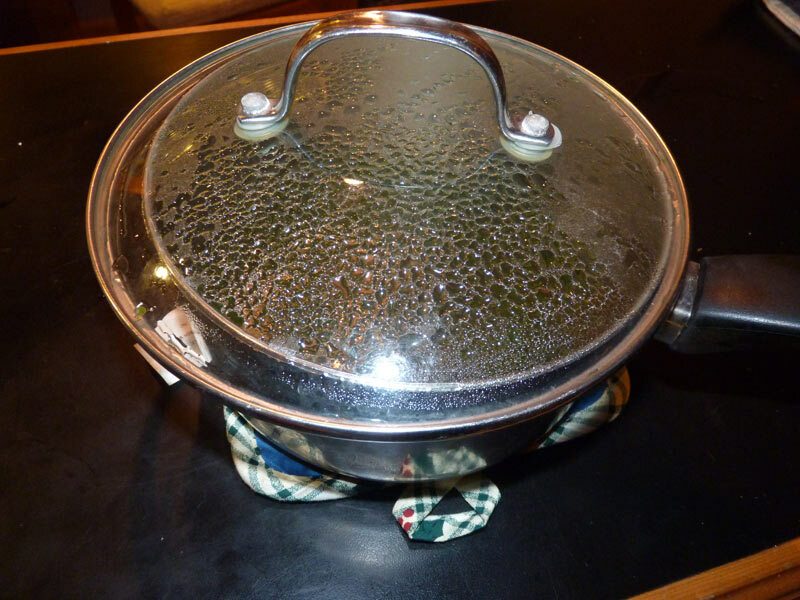 The lid is important–most of the healing action of the herbs is in the volatile oils, which can escape through steam. The volatile oils in the steam are exactly what we want, but not till we are ready for them! As soon as the pot boils, remove it from the heat and get a towel ready. Be very careful because the steam is hot. I have found that waiting a few minutes before breathing it in is much more comfortable or you can stay a little further away from the pot. 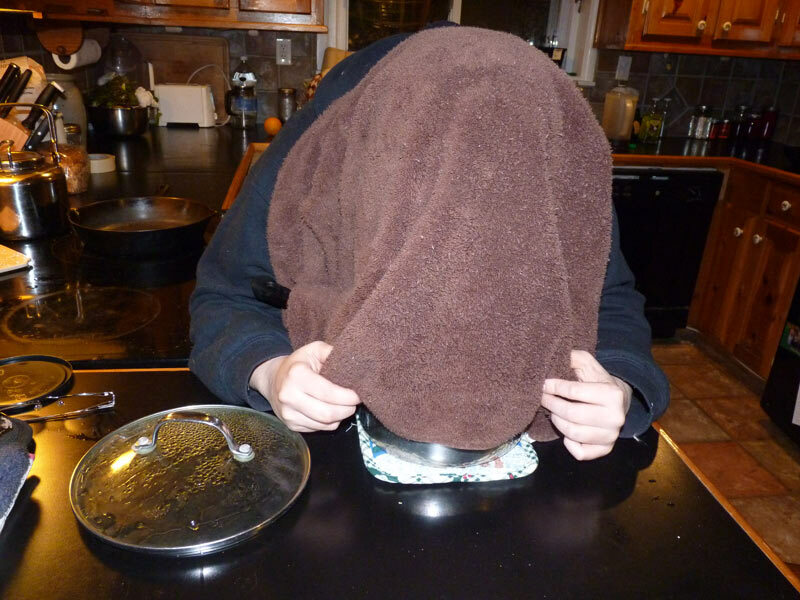 You put the towel over your head, drape the towel down around the pot, lift the lid, and breathe in. I think pictures illustrate this well. 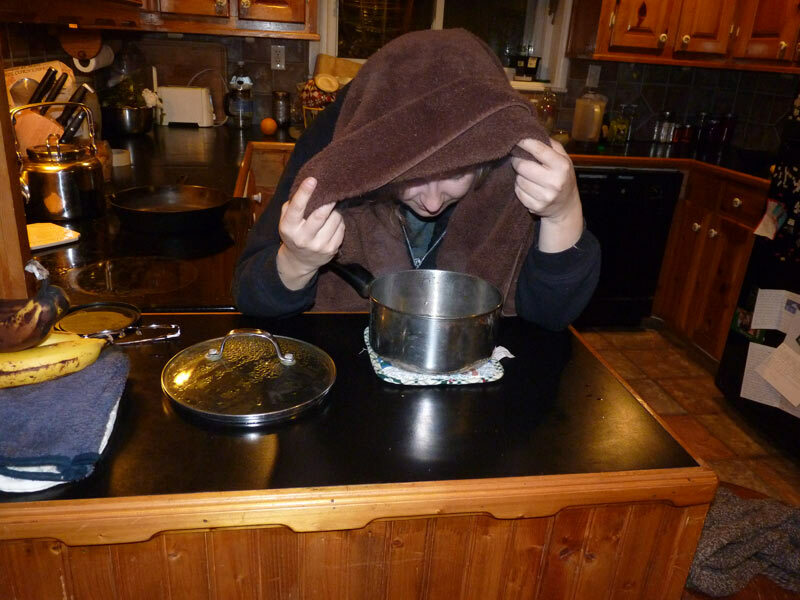 And finally, when the steam is comfortable enough…. This worked AWESOMELY well. My nasal passages are much improved, the sinus pressure has lessened, and the mullein did wonders on the nasty gunk in my lungs. I’ll do this several times each day until my lungs are clearer. I’ll follow this up with regular doses of New England Aster (which I have been using to control my asthma) and will hopefully be much on the mend soon.